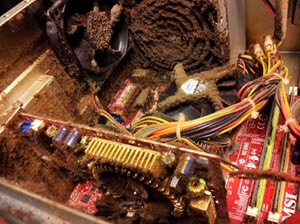 The computer got very dusty inside and the dust is covering the elements and holding in the heat. The vents were covered with papers or by shoving it against a desk. If your CPU is running over 150 degrees Fahrenheit it is running too hot and something needs to be done. For laptops a laptop stand with fans to help cool it will help. For desktops it generally means you need to open up your case and look at it. While it is running and open, check and see if the fans are all spinning in what appears to be a normal manner and see how dirty it is. Fans can be replaced inexpensively. Dirt can be vacuumed and blown out. You should clean your computer annually, or at least every other year. You can vacuum with a plastic attachment (do not stick a metal attachment inside your computer), and a can of pure clean compressed air. In the last few months I've discovered two computers running too hot and alerted my clients. They both cleaned out their computers and reduced their CPU temperature by an average of 65 degrees. I use the open source Open Hardware Monitor to track my and most of my client's computer's temperatures, though some clients will have programs I used before I found Open Hardware Monitor. So as part of your monthly maintenance you want to run this program (or another I put on your computer) and check the temperature.